Paranormal Activity 4 Review Long time fans of the franchise will view this as an entertaining, albeit inconsequential, addition to the canon of the series, but the lack of revelations concerning the increasingly muddled mythology may serve to disenchant them somewhat. Hopefully the upcoming fifth instalment will be more forthcoming. In 2009, a smartly made little found footage film took the world by storm. 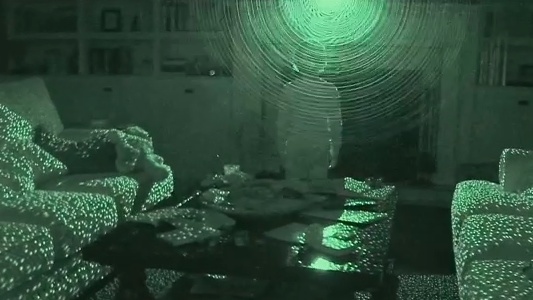 Shot on a shoestring budget, Paranormal Activity served as a beacon of what was possible to those who viewed high production costs as a barrier to making a successful independent film. Fast forward to 2012 and the unlikely has happened: The Paranormal Activity franchise has become a commercial juggernaut, churning out a fresh instalment each Halloween in a tradition that fills the gap left in the market by the annual oversaturation of Saw sequels. So how does the most recent instalment hold up? Unlike the previous sequels, which focused primarily on the back story of the Demon’s first interactions with a young Katie and the abduction of her Sister’s child Hunter, Paranormal Activity 4 ostensibly moves the story forward by picking up five years after the previously mentioned abduction and the deaths of Katie’s sister and husband and her own partner, Micah. Moving in across the road from teenager Alex, Katie soon disappears, leaving her child Robbie in the care of Alex’s family. It soon becomes apparent that Robbie isn’t a normal child; he talks of an invisible friend and draws arcane symbols around the house and on Alex’s little brother Wyatt, claiming that doing so will “help them see Him”. Alex’s boyfriend Ben notices Robbie climbing into bed with a sleeping Alex after recording one of their webcam chats and the two conspire to set up cameras around the house in an attempt to get to the bottom of Robbie’s bizarre behaviour. It’s clear that by this point in the franchise the directors have mastered the art of faux home-video filmmaking, so the scenes come off as natural and unrehearsed. However, a majority of the film is basically one protracted set up to the final scene. This is a common structure for horror films but never has it felt as overtly obvious as it does here. Directors Ariel Schuman and Henry Joost seem to be going through the motions here, padding out the rather skeletal plot with pointless footage that goes no way to answering the myriad of questions long time fans of the franchise may have. One has to wonder if this is the direction they saw their career going after they gained success with the brilliant Catfish. Alex and Ben make for likeable protagonists and their naturalistic interaction goes some way to making the premise of the film believable but it’s hard to feel anything for the characters once they’re finally thrust into danger; the script is meandering, drip feeding information regarding the witch’s coven introduced in the third film without ever actually moving the story forward and the “scares” of the film amount to not much more than shots of children and Katie standing in the dark staring at something and a swinging chandelier. The film does an admirable job using different camera sources, such as webcams and even the Kinect, but when compared to the brilliant Fan-Cam from part 3 these gimmicks come up short. You wouldn’t expect a film that purports to be “found footage” to have an image quality up there with multi-million dollar blockbusters and Paranormal Activity 4 isn’t going to change that expectation any time soon. As is fitting within the context of the film, picture quality is tantamount to that of a decently priced consumer-grade camcorder, so don’t expect the crisp image and intricate detail usually found on Blu-ray. Colours are slightly washed out, particularly skin tones and the grainy night shots but again these apparent flaws further serve to sell the concept of the film really being comprised of home footage and in that respect, the transfer more than does its job. Paranormal Activity 4 comes with a robust DTS-HD Master Audio 5.1 lossless soundtrack; unfortunately this isn’t truly taken advantage of until the final fifteen or so minutes of the film when the fright level (and, by proxy, the sound levels) get ramped up to ten. There’s nice differentiation between individual sound elements and no bleed through from other channels. Overall it’s a nice little transfer that serves the film well, with no technical issues apparent. The only real extra feature of note is a 28 minute compilation of raw, unedited clips called ‘The Recovered Files’. Aside from a few amusing interactions between Alex and Ben, there isn’t anything here that adds to the film, proving to be almost as tedious a viewing experience as the movie itself. Also available is the option to watch either the extended version or the more streamlined theatrical cut. It’s not hard to see why the studio keeps pumping out these films – With a budget of just over 13 million for four films they’ve made over 700 million in return. Numbers like that indicate that the franchise is here to stay regardless of the critical reception of this film. Indeed, Paranormal Activity 5 is already in pre-production, with original director Oren Peli returning to the helm. Following the surprisingly well crafted sequels, Paranormal Activity 4 appears to be the first major stumbling block in this franchise’s lucrative history; with too many monotonous scenes punctuated by clichéd “JUMP!” scares, this entry relies too heavily on what has worked in the other films, turning the experience into one of familiarity and, dare I say it, boredom. Long time fans of the franchise will view this as an entertaining, albeit inconsequential, addition to the canon of the series, but the lack of revelations concerning the increasingly muddled mythology may serve to disenchant them somewhat. Hopefully the upcoming fifth instalment will be more forthcoming.